In an exclusive interview with RIR, Salman Khurshid, India's former Minister of External Affairs and senior Congress leader emphasized the need to refresh the relationship between Russia and India that has become somehow obscured with both counties changing foreign policy priorities. 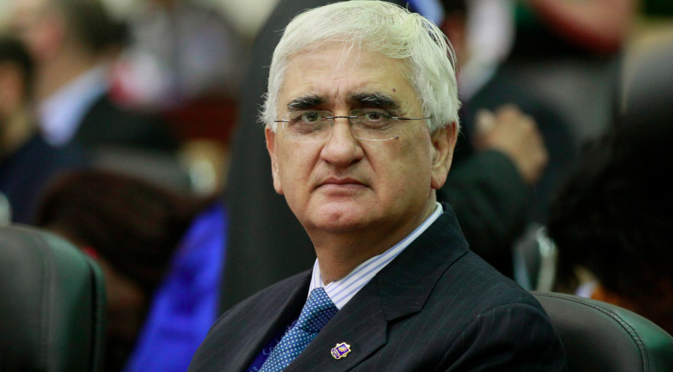 Salman Khurshid, who served as Indian's Foreign minister from October 2012 until May 2014, is a senior leader of the Congress party, an Oxford graduate, and a writer. He authored 'At Home in India: A Restatement of Indian Muslims' (Vikas 1987) and 'Beyond Terrorism: New Hope for Kashmir' (UBS 1994). His father Khursheed Alam Khan was a noted politician and educationist and his grandfather, Dr. Zakir Hussain was the 3rd President of India. Mr. Khurshid, how you see India and Russia relations evolving? Today Russia is preoccupied with many fresh priorities, it is readjusting itself to the West in many ways and therefore, the priority for Russia has been Europe and the West, both in a positive way and a negative way. I won't say Russia has lost sight of India, but that our relationship has been relegated to a lower priority than in the past. Another factor is that many of the traditionally strong India hands in Russia have changed. There is a new generation of people in administration and politics that is more familiar with the West than with India. In the past there were people who had served long terms in India, who could speak Indian languages, who understood and knew Indian leaders in a very friendly sort of way, and there are still a handful of them left in Russia. Meanwhile, India has also shifted its focus and has become more focused on the United States for various reasons. So the pull and the push between Russia and India has reduced considerably. Having said this, I still would record that we remain very deeply engaged with Russia as far as our military supplies are concerned. The co-operation that Russia has shown on our civil nuclear programme is something that we have to acknowledge. When others were imposing sanctions on us, Russia continued to support. So I feel the relationship needs to be refreshed. We have much more to gain from Russia then we realize. Russia did less politics with us in its friendship, and we will have to suffer in our friendship with anyone else. Talking about latest geopolitical developments, do you have a feeling that Russia and India share the same concerns and stand by each other? Today we don't automatically count in policy making in Russia. I think I'm not wrong in saying Russia didn't check with us about Syria. When Russia wanted to talk to us about the issues in Crimea, at that time we were not quite certain, how strong Russia's position would be vis-à-vis India's problem on Kashmir. So suddenly issues that were not in doubt at all in past had started becoming issues of some doubt. In the past we aligned with Russia on Hungary and Poland, on Afghanistan, but we could not align with Russia on the issue of Crimea. In Russia, it was widely felt and believed that India had supported Russia on this matter. Russia was sensible in not creating a situation in which we would have been put in a dilemma. Whether it was done out of friendship or out of good tactics, is something that you need to understand. When President Putin called friendly countries to explain what his position was, we were kind of worried that if Europe was opposing him, and America was opposing him, could we really isolate ourselves from Europe and America and stand by Russia? This is not something we ever thought of in the past. Then it was automatic: if Russia wanted our support they would get it, but this is a two-way thing. We are also not certain that Russia today would be able to be the blind supporter of India’s position on Kashmir as it has always been in the past. This is where things have changed. We no longer sing “Mera joota hai Japani, yeh patloon Englishtani, sar pe laal topi Russi ... phir bhi dil hai Hindustani”. That “lal topi russi” we don't sing anymore. People believing in the traditional India-Russia friendship would say that this should not have changed, because non-alignment of India was possible because of Russian support. Well, we were not an ally of Russia but we did have a peace agreement, we did have a very special strategic relationship. At the same time, we still had feeling that we could be non-aligned because Russia understood non-alignment. America does not. And therefore today if we have to make a choice, the sensible choice is Russia. America will always keep hoping for more and more from India, Russia will not. Today strategic analysts talk about Russia's “Look East” policy guided by search for new economic, energy partners, as well new partners on the geopolitical stage … What is there for India? I have not seen much change so far. I don't see much development in the last three years. I would not say the relationship is bad or it is in decline, I think it's on a steady plateau whereas it should be going up. I think the present government in India doesn't have a feel for Russia, the kind of feel that the Congress government had. The present government is trying to cater not to the mass population but to the elite, the business. There is a strong business lobby that supports Russia, but it is not as glamorous as the lobby that supports the US. Russia has always had less fanfare than the US. As I said, our relationship with Russia has enormous potential and we need to pay greater attention and explore possibilities that seem to have got obscured because of Russia's preoccupation with domestic and Western Europe issues and India's preoccupation with various things including China. We need an impetus now. The base is there, we don't have to make a new base; the superstructure is also there. What you need to do is just give it some fresh paint. How does India see Russia's rapprochement with China? Russia has to be conscious and sensitive, while it is important for them to have rapprochement with China and it worked very well, but it should not be at India's cost. What this means is that first, Russia should not take sides, and it won't. Second, China's engagement and involvement in Southeast Asia and the Indian Ocean can be diluted if Russia makes the right moves. They could do it under the pretext of BRICS, or Russia's own re-emergence, as it is happening in the Middle East for instance. How do you see the evolution of BRICS? How successful has it been so far? I think there is some lack of coordination in terms of respective economic situations in BRICS countries. But on the whole, I think there is a good potential. The larger question is... in the world, does economics decide everything or is there something else which decides the economics? Ideology doesn't play the same role today as it did 20 years ago, so is there something else? When we speak about BRICS, we feel a lot of political decisions cannot be taken because it is supposed to be an economic group. But is enough happening in economics within the group, separately from the various regional organizations? I think BRICS is a good idea but it needs to be fleshed out and we need to work a little bit more on it. The New Development Bank is an excellent step forwards and I hope it will initiate new things, but there is a lot of work that still needs to be done.